60 photos of a base which attracted world wide attention in 1968 when its garrison of US Marines was besieged by the North Vietnamese Army. Both sides saw the battle as a chance to repeat the very similar 1954 battle of Dienbienphu, when the French had been catastrophically defeated and driven from Indo-China. Then the French had occupied an isolated airstrip but had failed to occupy the high ground which surrounded it and were unable to supply it by air. In 1968 the Americans did occupy the high ground surrounding Khe Sanh and had massive airpower, including B-52s. Eventually Khe Sanh became a stand-off from which the Americans voluntarily withdrew - something the North Vietnamese hailed as a great victory. The battle had coincided with the Communists' Tet offensive on towns and cities throughout South Vietnam. Militarily the offenive was a decisive defeat for the Communists, but politically it proved to be a decisive victory, prompting the American decision to start withdrawing from Vietnam. 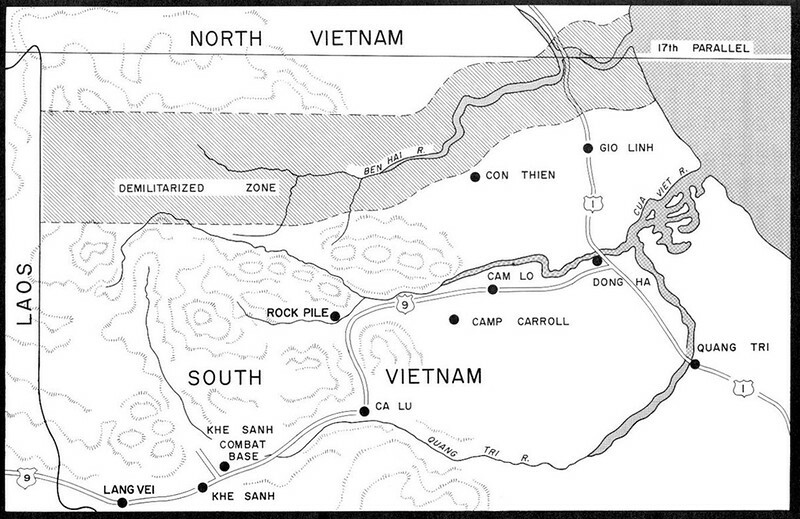 Khe Sanh area map. Khe Sanh is in Quang Tri province in the far north of former South Vietnam, and is close to the border with Laos, through which the Ho Chi Minh trail network ran.